School was never really hard for me; life at home was pretty rough and complex. Elementary school was pretty fun. When you’re young, having fun is the only thing on your mind. Even during class it was always fun to learn. Spelling tests, reading, writing, all was easy. Math is the one subject that I was never good at. When I entered middle school, things started to change. My mother passed away and I tried to focus on my education, but life was completely different without my mother. Now I was really feeling like an adult. High school was when I took the wrong turn. I got involved with the streets. School was the least thought passing thru my mind; huge mistake on my part. Instead of getting my education I ended up going to jail. 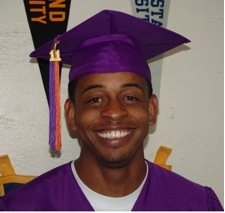 With the help of EOYDC I’m in the process of completing my GED. The program is great and has many resources. What I like most about the center is the fact that the staff is willing to help you out. Now I have a resume to present to companies that are hiring. All this was possible with the help of the EOYDC. Education is the key to success in this life. Dropping out of school should never be an option.